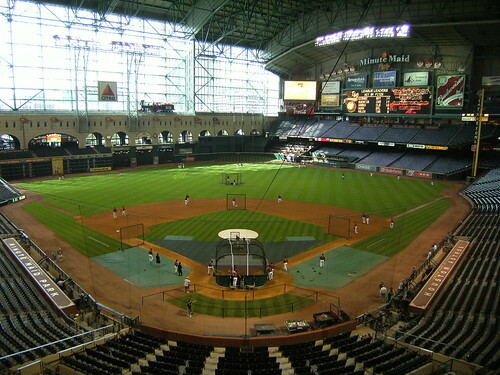 Minute Maid Park is located in downtown Houston. By “downtown” I mean it’s one of those areas that was formerly neglected, the original center of the city, and that the city is trying to revitalize. There are some residential buildings, but it’s mostly commercial, government, entertainment and hotels. Aside from after the game, the only people we saw walking on the street were the people who clearly were going to work at the businesses in downtown. We never felt unsafe – we had multiple offers of help the one time we stopped to doublecheck something on a piece of paper – but it does have a bit of an odd, semi-deserted feeling in spots. Union Station is also where you will go if you are taking any of the ballpark tours, and is the location of the team store. The most important part of the review is right here: You cannot bring ANY food or drink into the park. No water, no snacks. The guards aren’t searching your bags for contraband, they are looking for granola bars. If you think I am kidding, I watched a security guard confiscate a package of Twizzlers and a quart ziploc of homemade popcorn. It’s unconscionable that in Texas you can’t bring a bottle of water in – even in air conditioning, you need to hydrate. Rant over. 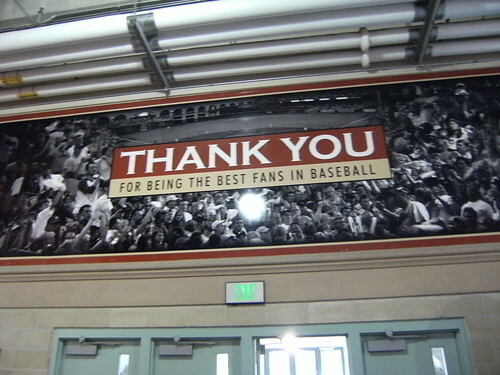 BALLPARK TOURS: We are ballpark tour junkies. We take them everywhere they are offered, off-season and during the season. 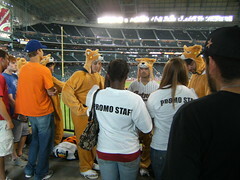 For Minute Maid, we chose their “Twilight Tour,” which starts at 4pm. You can’t see the clubhouse or the dugout, but it does get you onto field level right behind home plate during BP, before anyone else is there. The tours are supposed to be limited to 50 people, and you pay more for this tour than you do the other standard tours. We were rushed in and out of every place we were taken into, and the only thing that the guide bothered to take the time to tell us was his continual reminders that we should be quiet and we shouldn’t touch anything and we shouldn’t take anything – which I understand are needed, people are stupid, but everyone who worked at this ballpark was so incredibly polite, a “Please be sure” or “We’re getting this room ready for the game, so please..” or “I know it’s tempting but people are working so we’d appreciate it if you could be quiet.” would not have taken a lot of time and would have made you feel like customers and not burdens. Of course, given all of those cautions, the one caution we weren’t given was that we weren’t allowed to cheer for the players when we got taken out to watch BP. As I mentioned in my writeup of the weekend, I saw Ryan Church in the dugout, and since I haven’t seen him in forever and was excited that he was suited up and hopefully going to take BP, I yelled, “Hey Ryan, you’re looking great!” and was immediately pounced on by two security guards and told I had to move away…away, when I was already, what 30 feet or more from the dugout in the seats behind home plate. I immediately responded, as politely as possible, that I had never been to the park before, didn’t know I wasn’t allowed to cheer for the players during BP, and that I wasn’t doing anything wrong. I moved a few rows away but came back later. I can understand if this is a rule, and if I had been told about it I would have followed it. But the reaction was ridiculously over the top. We saw the park from the upper level, from a standard suite, from the owner’s box, from the press level, and got to walk through the Diamond Club on the way to field level. Most of this, pretty standard. The attraction to this tour is the early field level access, which would have been great if I’d had my camera, which I didn’t. We probably would have been better off taking the standard tour, which would have probably been less rushed, and taken us to more places in the stadium. The early access to BP is imho not worth the tradeoff, even for an Astros fan, and defeats the point of the ballpark tour. 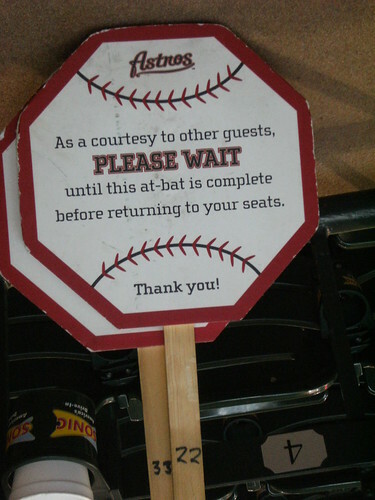 You can get into early BP in a lot of stadiums without having to pay for it. TICKETS: When we visit other ballparks, we generally pick up one pair of great seats (usually from the secondary market) and one pair of affordable seats (either from the team or a secondary market bargain). 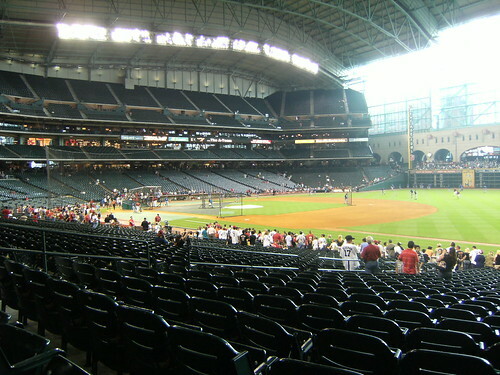 Even our affordable seats were phenomenal in Houston. 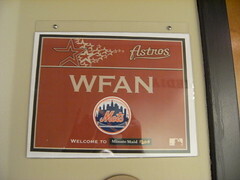 I imagine that if you wanted to see any other team besides the Mets, you would have your choice of seats. In our case, we did have to put more than a little effort into finding good seats, so don’t leave it until the week before you go if that’s the impetus behind your trip. 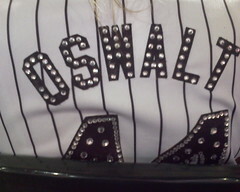 We sat about eight rows behind home plate in Section 120 and then further down the first base line in section 128. We would have liked to get something further up but behind the plate but nothing great was available. (We don’t like outfield seats as a rule, which is why we didn’t sit in the Crawford Boxes. However, if we had been there for the entire series and not just two of the games, I would have sat there for one of them.) If I went back, I would probably still try for field level down the line. 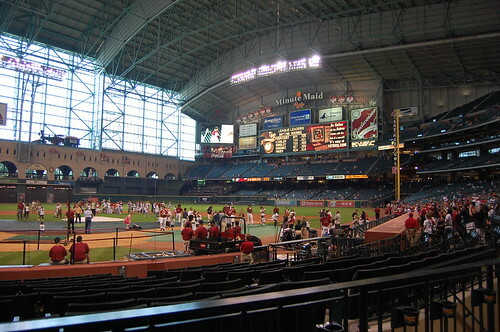 BALLPARK FEATURES: Minute Maid Park has a retractable roof, and it is closed and AIR CONDITIONED for 85% of the games at the park. If you think this is “not baseball,” go see a game at Arlington in August and then come back and talk to me about it. The Train: hopefully, if you go to see the Mets, you will only hear it once, at the beginning of the game. Layout: It’s your standard HOK open concourse layout, with balconies out in left field for standing room patrons. Bathrooms are conveniently located, food is not far, and if you happen to be in one corner (like right behind home plate, where the press box is) that you can’t see the action, tvs are everywhere. The visitors bullpen is not accessible, hidden underneath the walkway along the outfield. The Houston bullpen is in the outfield. There is standing room along left field, but you will have to compete with the Little Pumas and Los Caballitos for space. 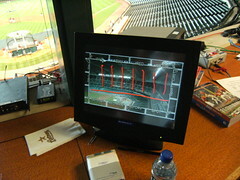 What I found particularly interesting about Minute Maid is their efficient use of space to create the batter’s eye. Unlike most parks, that seem to eat up a lot of space, they angled the park so that it’s using very little good real estate, but still getting the job done. It’s subtle instead of creating a waterfall or a lawn or some other feature. It’s hard to explain without being there. 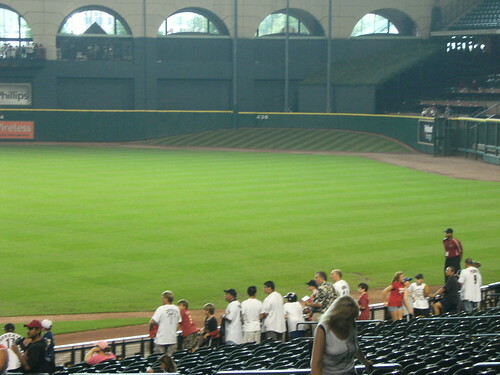 The thing I liked best about Minute Maid was the large wall of windows along left field. You’re downtown, and most likely under a roof, but the windows eliminate the cramped feeling you get in, say, Safeco, when the roof is closed. There was so much light we had to wear sunglasses for the first few innings. That was nice. For those who like to see the roof open and close, they do open the roof on Friday nights and have fireworks. We didn’t stay because of how badly the Mets lost. I’m sorry now that we didn’t stay at least to see the roof open. Team Store: It’s just inside Union Station and you can get there when there is no game. 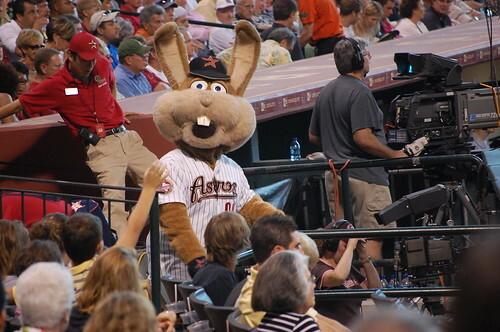 Mascot: Junction Jack, a jackrabbit, doesn’t seem to do much, and was hard to find. Not impressed. T-shirt tosses: use these completely ineffective slingshots. You could fire five tshirts out of a pepsi gun in the time it takes them to shoot off one. Music: the sound system at Minute Maid is AWESOME, and the music is appropriate. It’s not over the top, it’s not too much, but it is modern and effective. The song after “take Me out to the ball game” is “Deep in the heart of texas”. The words are on the Diamondvision so you can sing along. Don’t be a square. Heckling: The Houston fans are terrible at heckling. Zero originality. I would say “they can dish it out but they can’t take it” but they can’t even dish it out. It’s feeble. You will hear heckling and cheering en espanol, something I’m surprised isn’t more prevalent at Shea. 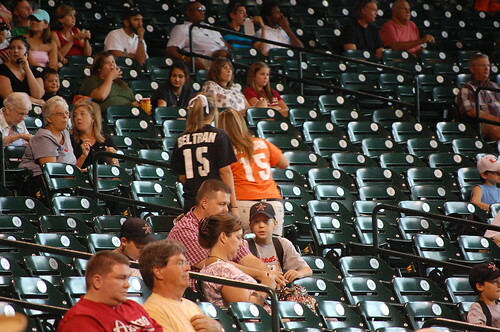 I would say “do not wear a Carlos Beltran shirt to Houston” but it’s not like wearing a Alex Rodriguez jersey to Seattle or Arlington, because the reasons they don’t like him are specious. I would wear one the next time because I think their logic is just stupid. 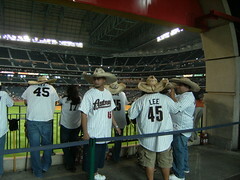 On the other hand, there were plenty of Roger Clemens shirts to be seen. Go figure. …that people were there to see the game, and actually were paying attention and cared about what was going on. I wanted to steal one for Section 12 back home. But plenty of people just walked right by them. FOOD: We were very disappointed in the food choices. Maybe we missed something, but I didn’t feel that there was enough to say “this ballpark is in Texas.” There was the Goya Latino corner and you could get a frozen margarita, but aside from that, hotdogs, sausages and other standard ballpark fare for the most part. 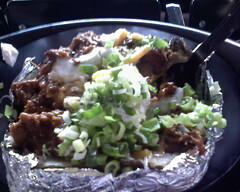 This, my friends, is the BBQ baked potato. that isn’t chili, that’s chopped meat. It was super-delicious. We had it twice. It’s also one of the cheapest items on the menu, at $6.50. An aside: we were on the tour with a gentleman who worked at the ballpark. He told us to not order any hot dog that wasn’t kosher. I will take his word on that. PARKING: is plentiful, and costs anywhere from $10-15 based on your proximity to the ballpark. ON the weekends you can park on the street for free, just check the signs. I’m not sure I’d park on the street at 3 in the morning down there (especially close to the highway) but given the amount of people on the street & the police presence, we left luggage in our car during one game and felt okay about it. 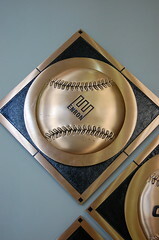 HOTELS: there are many downtown, all walking distance from the ballpark. We stayed in an incredible five-star boutique hotel called Hotel Icon, which was significantly less expensive than any chain hotel and offered a level of service (and all-night room service) that we wouldn’t have gotten from a chain. Cannot recommend it enough. If you stay downtown, you don’t need a car – and there is light rail – but keep in mind that this is Texas and you will probably wish you had a car if you want to see anything that’s not downtown, the mall, or the ballpark. Arlington is only 3.5 hours away, so get a car and see two ballparks in one trip. 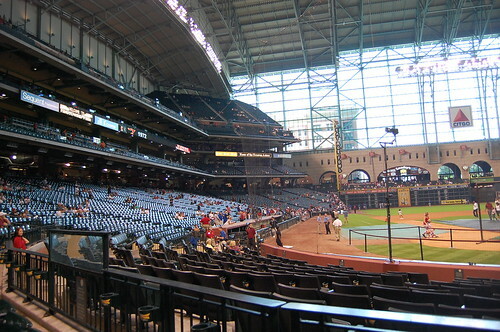 MINUTE MAID PARK: THE REVIEW.